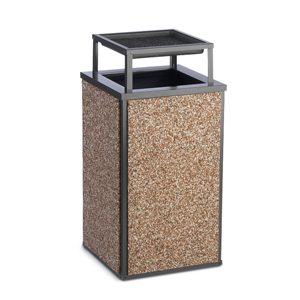 This Essence 30 Gallon Trash Receptacle with Bonnet Top (Model# E30AG) offers superior performance. When good looks and dependability are a must, look to the Essence Collection to meet and exceed you site requirements. Each panel is made with hand trowelled 1/2" thick natural stone cast in polymer matrix concrete adhered to a hardboard substrate. The bonnet top provides wide waste opening that shields contents from view while keeping the elements out. The large 30 gallon capacity is perfect for high traffic areas. 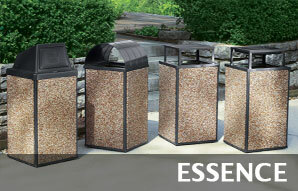 Click on the image below to see all of the impressive stone trash receptacles the Essence Collection has to offer.